Lisa Burman is an experienced teacher, elementary school leader, and educational consultant. Her teaching background is in early childhood and special education. She has worked in schools in Manhattan and Australia and is an internationally recognized presenter. 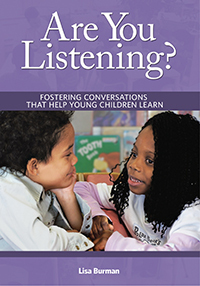 Conversations are more than an exchange of words; they are the core of the teaching method discussed in Are You Listening? This book offers early childhood educators an original model for using conversation as a learning tool in the classroom that is child-centered and compatible with emergent curriculum and Reggio Emilia approaches.